ICT Proposers’ Day 2017 included the presentation of the official calls for 2018-2020, training events, networking workshops, project presentations and targeted face2face meetings with representatives of organisations interested in submitting proposals. The National Documentation Centre’s (EKT) contribution to the networking event “Face2Face Brokerage Event” was a great success. 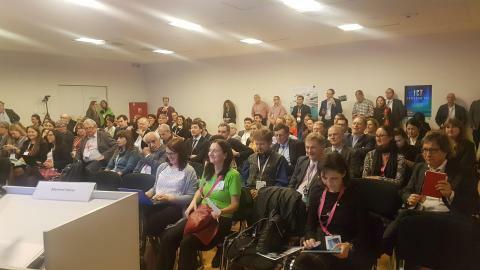 The event was held on 9-10 November in Budapest (Hungary) by the European Commission, the Enterprise Europe Network and Ideal-ist, the National Contact Point network for the ICT sector of Horizons 2020, as part of the biggest networking and communication conference - ‘ICT Proposers’ Day 2017’. 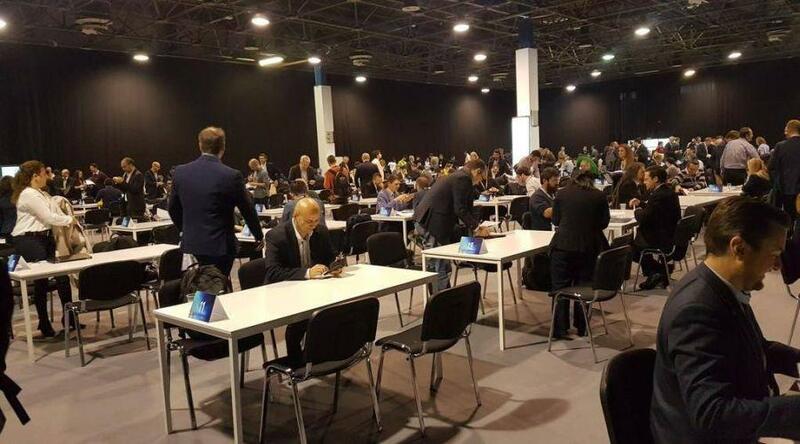 EKT, National Contact Point for ICT Horizon 2020, Ideal-ist partner and co-ordinator of Enterprise Europe Network-Hellas, supported the participation of a record 92 Greek organisations in this particular event. The ICT Proposers’ Day event focused on European research and innovation in the ICT sector, with special emphasis on Horizon2020’s work programme for 2018-2020. The event provided an excellent opportunity for academics, researchers, SMEs and government bodies from all over Europe and beyond not only to network and build mutually beneficial partnerships but also to stay updated on Horizon 2020’s work programme. It brought together more than 5,000 stakeholders interested in participating in any of Horizon 2020’s calls for ICT and Future and Emerging Technologies (FET). A record 92 Greek participants held 700 bilateral meetings - a total of 1,000 participants with 5,600 meetings! 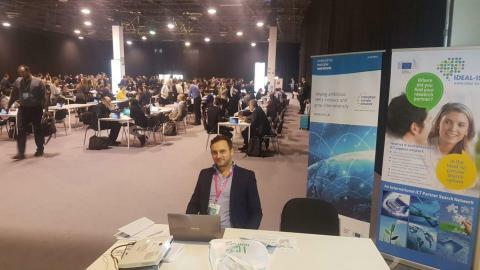 The biggest attraction was once more the face2face meetings for the promotion of collaboration which is organised every year by the ICT National Contact Points network Horizon 2020, Ideal-ist and Enterprise Europe Network. More than 5,600 meetings were organized for 1,000 participants, approximately 700 of which represented a variety of Greek organisations! As a member of the Ideal-ist network and co-ordinator of the Greek node of the Enterprise Europe Network, the National Documentation Centre and the EEN’s ICT Sector Group successfully supported the 92 Greek stakeholders in the bilateral meetings, a record number of participants. 52 of the participants chose EKT as Helpdesk, 16 did not opt for a helpdesk and 24 chose another helpdesk. 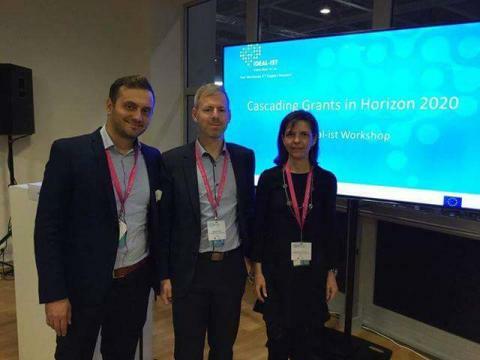 Cascade Funding (Financial Support to Third Parties) is a mechanism designed to strengthen the impact of expected results by enabling a joint venture, which has received funding from a specific call of Horizon 2020, to set aside a part of its budget for its own Open Calls. As this mechanism is available to enterprises of any size, it is an ideal means through which SMEs can advantageously participate. The Session for Cascading Grants Projects included round table discussions, in which experiences, views and advice on specific opportunities were presented by both project co-ordinators who give financial support to third parties and participants in such open calls. Taking part on the panel were Greek co-ordinators of major projects which have integrated the Cascading Grants mechanism, including HORSE (Robotics) and SymbIoTe (IoT), whose representatives gave tips from their own successful submissions. The key advice given by the panel to the audience was to take the next step and submit to an open call for any programme applying the Cascade Grants mechanism.